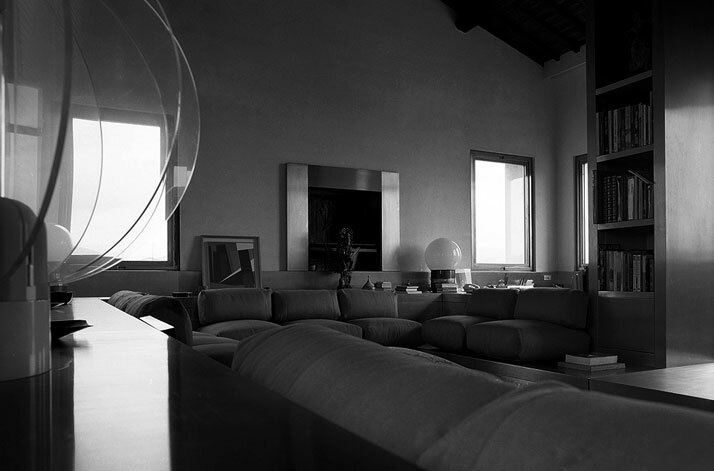 Ivan Terestchenko has received international recognition documenting the private homes of fashion and high profile designers for magazines worldwide including The World of Interiors, Casa Vogue Italy, and Elle Decor Italia. His recent work has included Raf Simons' Antwerp home, Frida Giannini's office in Rome and the home of Franca Sozzani, editor in chief of Vogue Italy, in Marrakech, to name but a few. When not working on high profile stories for publications, Ivan photographs surfers and their daily lives in a surfer's hut on the beach, and other expeditions on his well read site. Ivan travels extensively, has sailed twice across the Atlantic Ocean, and is an accomplished painter and sculptor. When he told me his ''dream is to have a surf lodge with a bar somewhere by the sea,'' I was not surprised in the least. Whether photographing, or sculpting in ceramics, Ivan's handwork is always present. There is undoubtedly a subtle sense of ''a storyteller'' in his art that captures and holds my imagination. 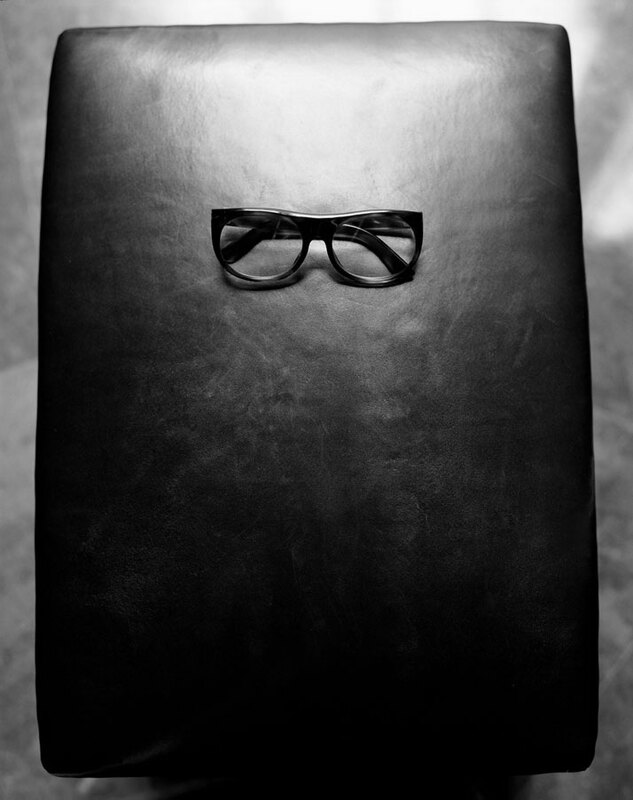 This November, Ivan's photograph of YSL's glasses will be included in an upcoming auction at Christie's in Paris. In the present day, when images are free to be passed around on the internet, it's important to recognize the artist behind the images we all love. His words, ''If you support photography, buy photographs by living photographers'' are a reminder. Words are mere words, until they are transformed and crafted in the poet's mind, and then, they become beauty. Ivan is a poet, and it only takes a fleeting moment with his work, to understand that this title is so true. 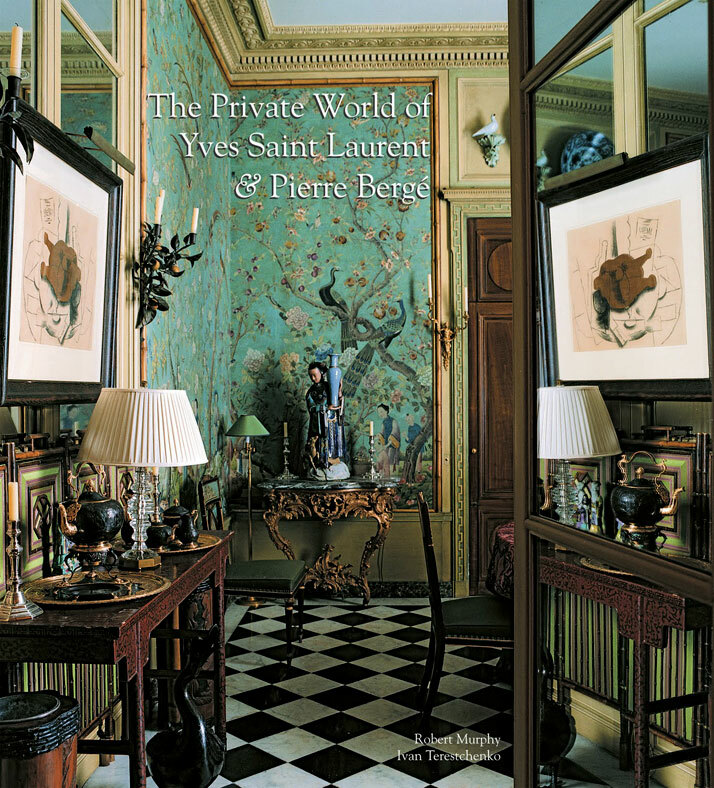 Our paths crossed a few years ago, when I reached out to him in appreciation of his book, ''The Private World of Yves Saint Laurent and Pierre Berge.'' Since that time, our friendship has flourished. I'm honoured to have interviewed Ivan Terestchenko for Yatzer, as Ivan has become not only a dear friend, but a continued source of revelation to myself as a designer. How did it come about that you came to France? My mother is French and my father, who was the son of Tsar Nicolas II’s last minister of finance, had been brought up in England and was schooled at Eton and then attended Cambridge University. He wanted me to have a British passport and so I was born in London on October 1st, 1958 (which makes me a Libra). I was due to go to Eton and went to a public school near Oxford, but by the age of eight, my parents got a divorce, and I moved to France with my mother. My father was the most glamorous and flamboyant man in the swinging London era. The story of my Ukrainian family is in itself a saga. They were one of the few greatest art patrons of the former empire for several generations throughout the 19th century. Although wealth doesn't impress me much, I do care about good manners and a sense of humour. When did you discover photography, and do you remember the first interior you shot? At first I never thought of using photography as an artistic medium. I was a painter before being a photographer, and I started photography precisely to get away from art. I still don't take myself much as an artist but rather as a dilettante with an artistic flair. I place great artists too far above myself to ever reach them, which is also the reason why I quit painting. I think I work better when given an assignment, but that is changing as when I look back at some of my older works, I like them more now than then. I find the process always more exciting than the result. The first interior I shot was a 18th century Hotel particulier in Paris decorated by Alix de Dives for Pierre Frey. This was not quite an official assignment, but nevertheless got published in French Vogue a month after. This gave me the opportunity whenever anyone asked for which magazine I was working with, to reply genuinely, ''Vogue!'' 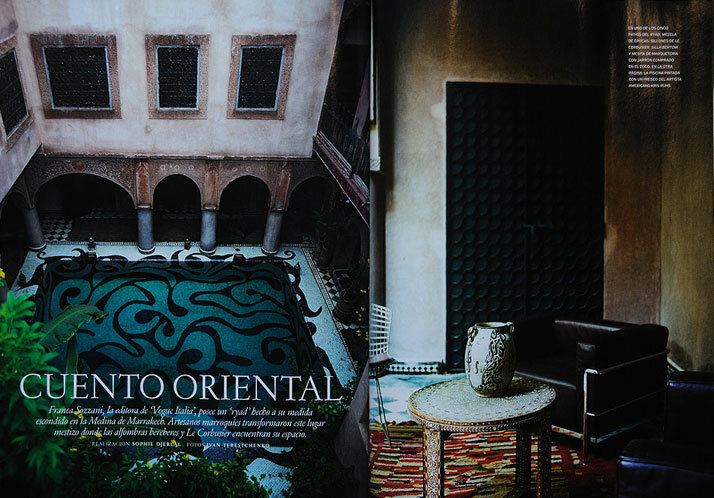 I then got an assignment, this time officially, to photograph La Rocca di Soragna, a beautiful Palazzo near Parma for Maison et Jardin, also a Conde Nast publication. I completely restyled the palazzo so that it resembled a Visconti production and took a hundred photos. In your opinion, when does photography succeed? Photography succeeds when it speaks to the soul. Are you self taught? What did you do before becoming a photographer? As a painter I wasn't making a living so I was teaching drawing and watercolour to some private students. Deborah Webster who was a stylist working for Vogue Decoration with Marie Paule Pellé, was one of my students. Marie Paule Pellé, this should be said, was an exceptional editor and is the person who created the worldwide decoration magazine phenomenon as we know it today. Deborah asked me to come with her on a set with the photographer Pascal Chevallier just to help carry things. It was in a Chateau in the French countryside and what Pascal and Deborah created in it, was absolutely brilliant. At that time the French school of decoration photography was the best in the world. 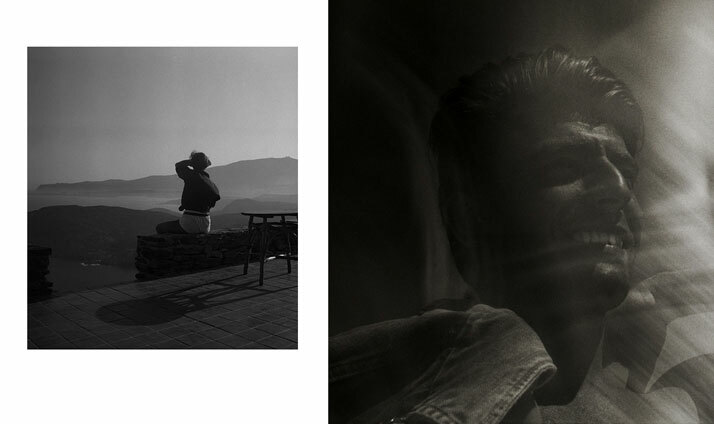 Francois Halard, Pascal Chevallier, Thibault Jeanson, Alexandre Bailhache were great photographers, but the stylists who teamed with them were also excellent. I totally adored the job and decided on the spot that this was made for me, this would be my life. Pascal asked me to be his assistant a couple of times; though he never let me look through the camera lens at what he was doing, what he was framing, nor gave me any technical advice whatsoever ... Just looking at him taught me what I needed to know. I needed a camera, a few lenses, a tripod, a light meter and that's about it. I also worked with Robert Polidori, he is good friend, and I love his work, but he had little influence on me. The rest is just my own point of view. So yes I would say that I am self taught. It has one advantage, you're on your own with no influences. Can you talk about how you came to photograph The Altana of the Palazzo Pucci which Gae Aulenti did the interior design for? When I was in my teens, in the 70's, my father gave me as a birthday present, a subscription to a wonderful magazine: ''Connaissance des Arts''. Although it is still in circulation today, it is nothing compared to what it was then. Anyway, each month I couldn't wait for the next issue to arrive. It was full of wonderful art as well as the best interior decoration worldwide. 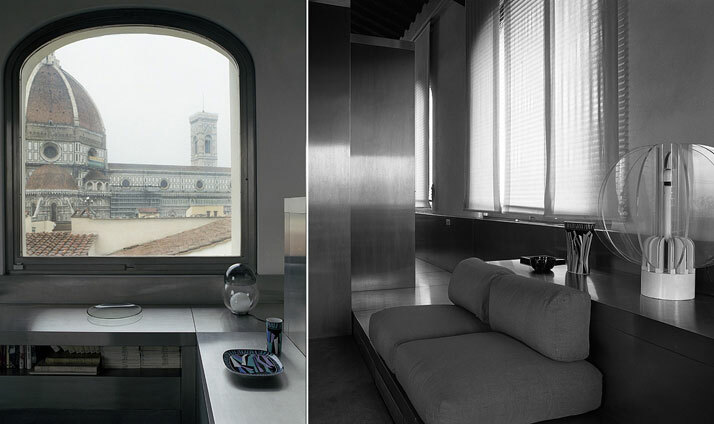 Even today I can still remember the thrill when I saw a Venetian chapel turned into a private house, extraordinarily elegant and chic beyond imagination, combining gothic architecture with modern steel structures. 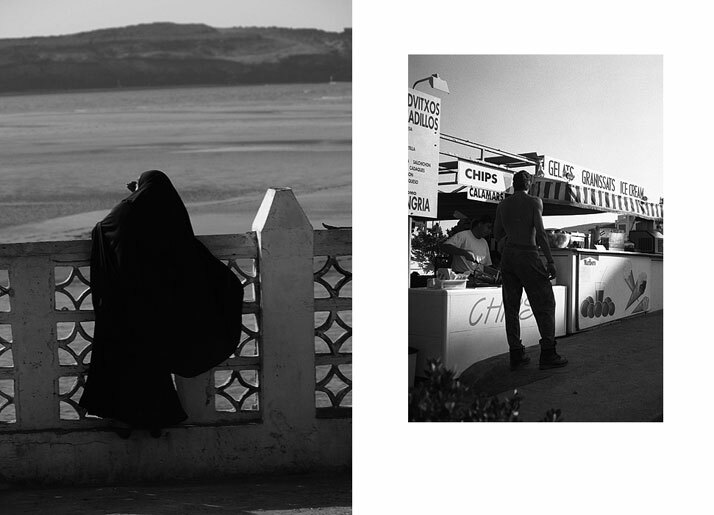 Much later, when I became a photographer and started to work for magazines, I had these places in mind. There aren't that many places that are truly "flamboyant". The Altana of the Palazzo Pucci is one of them, a very very rare specimen. I had heard of the Altana, through my brother's girlfriend, a very beautiful Italian girl, who was a friend of the Pucci family. I hadn't seen anything but I knew this had to be flamboyant. At the end of the 90's, Vogue opened a title in Japan and I proposed that the editor do a story on Pucci which had almost fallen into oblivion. I met Alessandro and Laudomia Pucci for the first time in the early 90's on an assignment for Maison et Jardin to photograph the Antico Setificio Fiorentino, a silk workshop founded by the Puccis and other families in the 17th century; Emilio Pucci took it over in the 1950s.â¨â¨ Over lunch, Laudomia told me that she was looking for a carpet factory that could make carpets with her father's design. By an incredible stroke of luck, I had visited such a factory just the week before and I gave her their address.â¨â¨ A few years later when I came back to Florence, this time for Japanese Vogue, Laudomia told me that her collaboration with this carpet factory had been very successful. â¨â¨A few years passed and I went back to the Palazzo, when Christian Lacroix was the art director. I took a few new shots and asked if I could have a look at the Altana and this time was granted permission. â¨â¨The rest is history and of course the pictures themselves. How does your personal photography, shown on your site differ from your photographs that are printed for interior magazines? Interior magazines are generally the result of a marketing process which will go on and on, until we get sick of it, about a concept they think is successful, and decorators or designers will bend their work to get a chance to be published. I have never followed this mantra. Taste and style are words I hate. I care about poetry, humanity and quality. This is what I try to convey in my work for magazines but I have no control on the lay out. So on my blog, I'm the only one in charge. 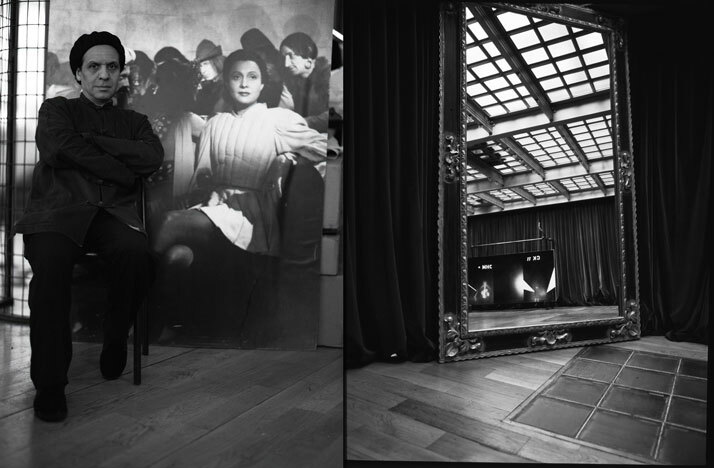 You've photographed people from Azzedine Alaia to Andrée Putman, to yourself. What is the most important element of a portrait to you? The famous or notorious are not necessarily the most interesting people to photograph. The most important to me is that the people I photograph are present, alive and that they are themselves in their own way and own time. It's very basic. Sometimes I have the feeling that I am photographing someone at a moment when he or she is at the peak of his beauty or happiness and doesn't know it. This is a very exhilarating feeling. What I photograph in people is not so much the way they look but they in which they glow and I do it all the time. I have once, once only, photographed a dead person, a Greek monk and the people around him believed him to be a saint. I didn't photograph death, I photographed devotion. 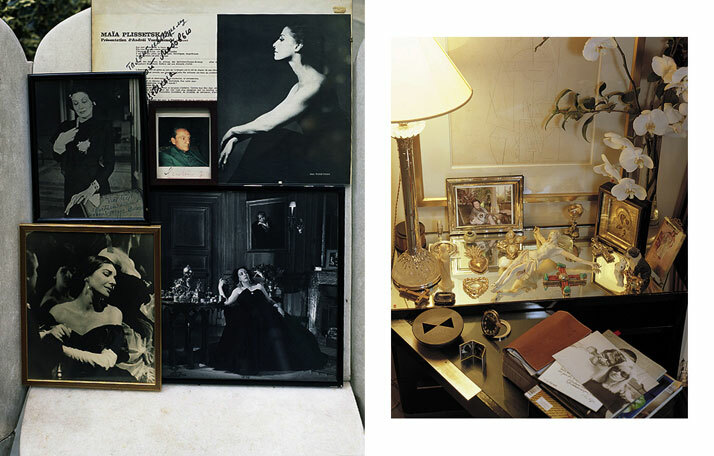 You photographed ''The Private World of Yves Saint Laurent & Pierre Berge.'' Can you tell us something about this project, how it came about, and the actual shoot? It was decided on the very day that Yves Saint Laurent died. There was a small party with Pierre Berge and a few close friends amongst which Robert Murphy. Robert proposed to keep a visual record of the house and art collection. Berge agreed and that was it. I had worked with Robert for W a couple of times and I guess he thought I was the right man for the situation. I think is what a good choice but I'm grateful he saw it that way because...well... it was going to be an important book. Photographing these rooms was very stressful. I had one day only for each house, the furniture being taken away by Christie's the day after. There was no time to reflect on the personality, fame or aura of the man who had lived there, but I couldn't help thinking that Yves Saint Laurent would have hated to see all these people trespass the sanctuary he had built for himself. Saint Laurent was a very private man. However I didn't feel I belonged to the crowd of scavengers, I wanted to be faithful to Saint Laurent's memory and I worked with great concentration and respect to give the most accurate record of what I was viewing rather than being smart with clever angles. Two simple things we should know about you? > I smoke but ashtrays should be kept empty. > My world is the third world and my dream is to have a surf lodge with a bar somewhere by the sea.